There are 25 public high schools in Montgomery County. Ten of those schools are named for people. One of those people was black. But three of those people owned slaves. Colonel Zadok Magruder, Thomas Sprigg Wootton and Richard Montgomery all owned slaves according to a combination of census records, wills and books on the subject. 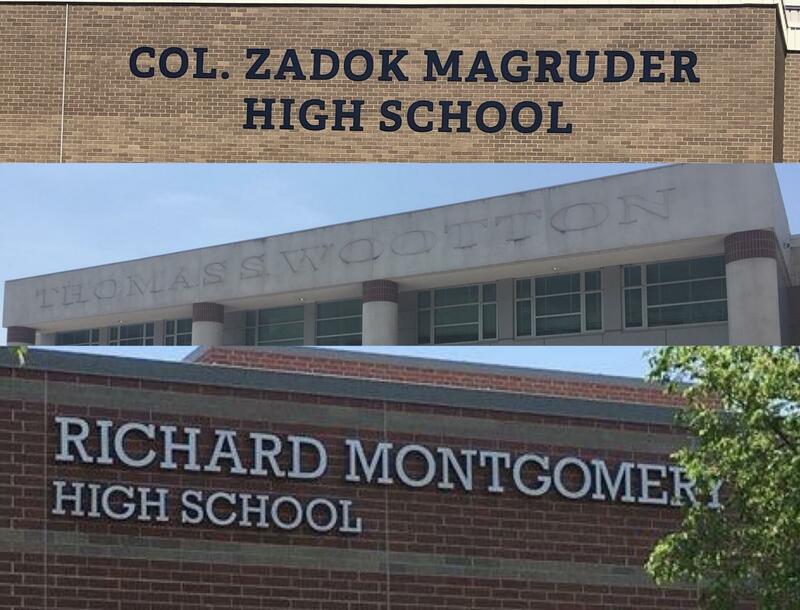 Magruder and Wootton high schools both opened in 1970. Magruder, a wealthy landowner in Montgomery County, was a Revolutionary War hero. Wootton, a member of the Maryland Colonial Assembly, suggested the creation of Montgomery County (named for Revolutionary War hero Richard Montgomery). Both used slave labor on their farms. Census records for Magruder show him owning 26 slaves in 1790, and the application for his home, The Ridge, to become a historic site in Maryland details the slave quarters of the house. His grandson, William Magruder, owned the Oakley slave cabin, which is now the property of the Montgomery County Department of Parks and operated as a museum. Wootton is documented as inheriting slaves from his father and leaving slaves and land to his nephew. While there is easily-found information about Wootton and Magruder as slave owners, the only solid evidence that Montgomery owned slaves exists in a line in his will, which states that he left his slaves, along with the rest of his property, to his wife, Janet Livingston Montgomery. Richard Montgomery High School was originally named Rockville High School in 1892 when it opened. But when the “Rockville Colored High School” opened 35 years later, “there was apparently some concern in the white community about the similarity of the names of the two Rockville (white and ‘colored’) high schools,” Buglass said. The concern led to the name of the white school being changed to honor Montgomery, the Revolutionary War hero, despite the fact that he never set foot in Montgomery County. A reference assistant at the Department of Rare Books and Special Collections at Princeton University, where the physical copy of Richard Montgomery’s will is housed, confirmed to The Current that the word “slaves,” not “shares” appears in Montgomery’s will. Morally-problematic information about historical figures who are otherwise referred to as American heroes often creates controversy. In August of 2017, statues and monuments commemorating Confederate soldiers and generals were removed in more than ten states following the Charlottesville protest. Though the history behind these names does not accurately reflect society today, Procknow does not think the names of either Montgomery County or Richard Montgomery High School should be changed. “My personal view on this is that I don’t think that there is a litmus test on anything we should do here because I think these are complicated situations,” Procknow said. He added that people should be educated about the history because no person is entirely good or entirely bad. *Editor’s note: Montgomery Blair was not included in this article because there is evidence that Blair, despite growing up in a slave-owning family, never owned slaves himself. Several elementary and middle schools in MCPS are also named after slave owners. The Current chose to focus solely on high schools for this article, but urges students and parents of students at other schools named for people to research the namesakes. Great story! Your investigative skills are impressive!!! Impressive article and defiantly a hot topic of conversation!! Way to get the ball rolling!! While you are right to point out that the Greeks and Romans had slaves, you fail to acknowledge the racial power dynamic between a white slaveowner and a black slave. Slavery in America was racist – since all slaves in America were black, being black MEANT that they were a slave, and there was no way for them to separate themselves. Unlike in Greece and Rome, where slaves were not chosen based on skin color – they were generally war captives. Some slaves in Rome were also given opportunities to move up in society, and their children could be granted Roman citizenship, which was not possible in America. So while you are right about Greece and Rome having slaves, I think that it’s ignorant of you to completely disregard the stark differences between these societies and America. Also, just because something is legal does not mean that it’s right and saying that they didn’t know better is EXTREMELY ignorant…if you ask me, they knew exactly what they were doing. Still do. We absolutely hold accountable anyone who owned other human beings in the “land of the free”. Do you know of any schools in MoCo named after African Americans who owned slaves? Thank you for this article and for the research you put into it. Please do not ever lose your determined curiosity! Thank you! And thank you for your support! We appreciate it! This is a great article, very informing and extremely well written – – thanks! Could you consider doing a Second installment dealing with the elementary schools? The Emancipation Proclamation (January 1863)didn’t free the slaves in Maryland. They were freed in November 1864 when Maryland rewrote its constitution.